I am behind in my posts. This first full week of November was a busy one but I did get out to paint. There were a few wet and wild days, and a few just plain wet days. If you look closely, the little dots you can see is the rain on my easel. This is with an umbrella over me too! It was wet this day but warm and no wind. It was a fairly pleasant day to be out and the waves were decent. Unfortunately, the wet crept in a bit too much and my paint did not want to stick after a while. 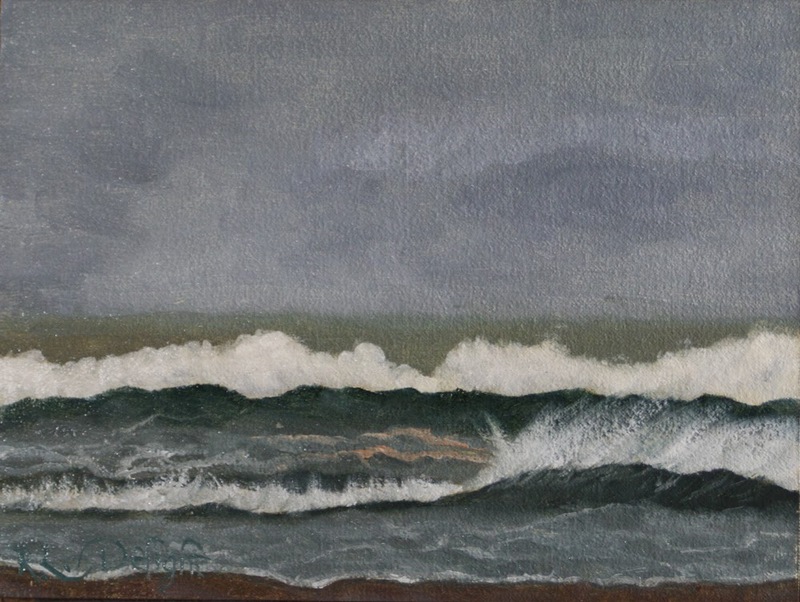 Here is wave study #66 which suffered a bit from the wet. 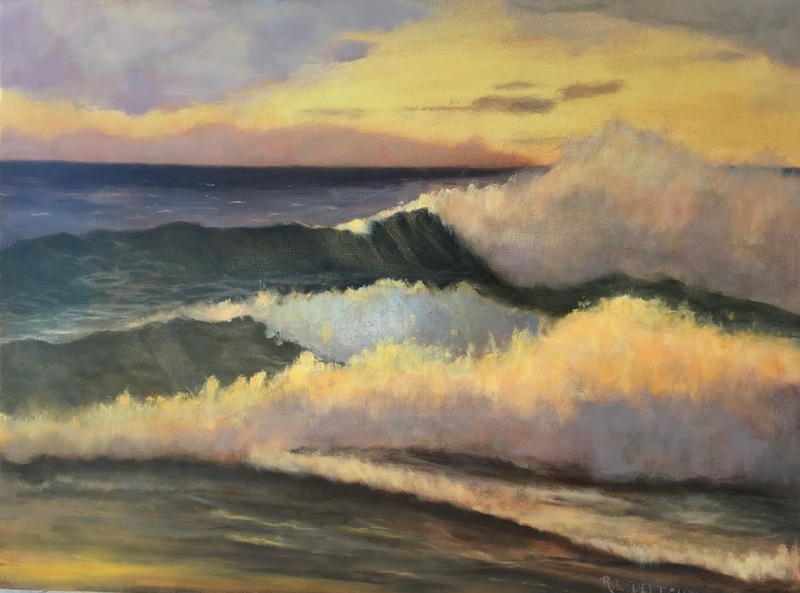 I painted last week's wave studies on canvas panels and they became my first two paintings for sale in my Workshop Fundraiser. I decided that I did not want to do that for several reasons. The main reason is that I want room to experiment, fail, make mistakes, and have a breakthrough, or two, once in a while. 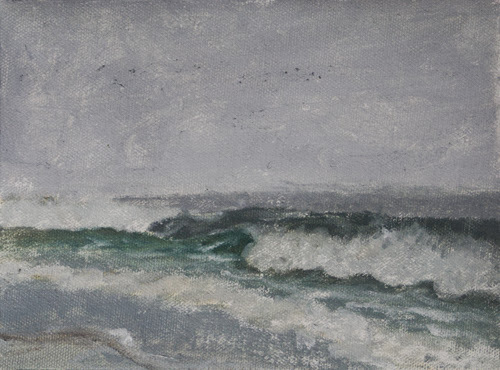 I also want to keep the wave studies. With that in mind, this week's paintings for the workshop fundraiser are not plein air studies but painted from a compilation of studies. They aren't finished quite yet but will be soon. 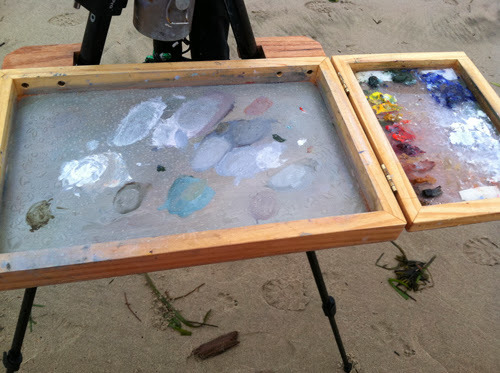 Both of the above wave studies were painted in about an hour to an hour and a half due to conditions. Wave Study #67 was done late in the afternoon on a mostly gray day. The sun peeked out through filtered clouds toward the very end. I pretty much ran out of decent light to paint on this one. Up to this point I have had a policy of putting the good, the bad, and the ugly on the blog to show not only my process, but what it takes to build an artist. Basically, it takes years and hard work! I am still going to more or less continue to post the studies but I am now going to allow myself not to post one if I choose. I want to give myself mental room to push a bit harder. That means even more mistakes and bigger messes than usual. One final bit, I am happy to say that my painting Zipper Wave sold and looks very nice hanging in a frame in its new home. This is a painting from earlier this year. More can be found on my Daily Paintworks site. I appreciate the support! Stay tuned for more new paintings. 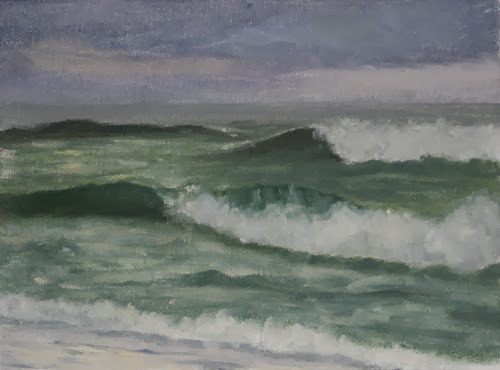 Wave study 67 is very beautiful- my favorite so far! 66 also caught the light of a grey day really well.